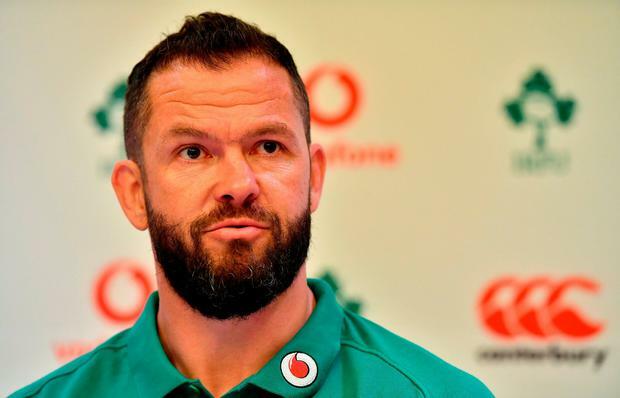 Ireland assistant coach Andy Farrell could join Ulster as interim head coach if the Scottish Rugby Union refuse to release Dan McFarland before January. Ulster agreed a deal with McFarland, Scotland's current assistant coach, to take over as head coach from Jono Gibbes for the next three years. However, the SRU are insisting that McFarland must see out his nine-month notice period that would only see him released in January, just after the end of the Heineken Champions Cup pool stage. Ulster and the IRFU are still hopeful they will come to an arrangement that would see their new coach released early, but in the event that he isn't, the IRFU have a contingency plan. Reports suggest that it will be national coach Farrell who will step into the breach on a temporary basis after the tour to Australia concludes on a seven-month deal. The Englishman would coach the side - much like Les Kiss did after the departure of Mark Anscombe - until McFarland was able to come in and take over. "We knew that when we signed Dan he had a clause in his contract, and we accepted that, and if it turns out that that’s the way that it ends up being then that’s fine," said IRFU high performance director David Nucifora this week. "We’ll just deal with that. We do have a bit of a Plan B in place if that’s the case, and we’ll just wait and see what the Scottish Rugby Union decide to do with Dan probably after the (Scottish) tour. "Obviously we would like, and Ulster would like, for him to be there at the start of the season but if he can’t be well then we’ll accept that and as I say we’ve got something that we’ll do to support Ulster." However, Nucifora did admit that they weren't expecting to need the Plan B as they are optimistic that McFarland will indeed be let go by the SRU. "I think (Plan B) is the worst case scenario," said Nucifora. "Do I think it will be January? No I don’t. I think there will be a resolution before then so I am not concerned that it’s going to be January."